1. "Jebus" and "boo urns." I may be an English lit major, but where would my everyday vocabulary be without these two expressive gems spawned by The Simpsons? They're on urbandictionary.com right now; someday, though, I'm sure they'll join "d'oh" in the OED and become official words/expressions in the English language. 2. 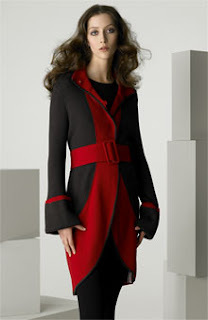 Alice + Olivia two toned belted sweater coat, $440. I've obsessed over sweater coats time and time again, but I do believe this one by Alice + Olivia takes the cake. Too bad about the price tag. Not only is it too expensive for me, I can't justify spending so much on an item that I know will pill with regular wear. 3. James Franco. Tortured artist? Please--I'll take a cute guy with a sense of humour over a sensitive suffering soul any day. I know James Franco from the Spiderman movies and his critically acclaimed portrayal of James Dean, yet it took the pothead antics of Pineapple Express to put him solidly in my good books. 4. "Wow" by Orlando Conga. I first heard this merengue track at one of the Sunday afternoon salsa socials and the darn song got stuck in my head. Warning: may cause uncontrollable swaying of hips and tapping of feet. 5. 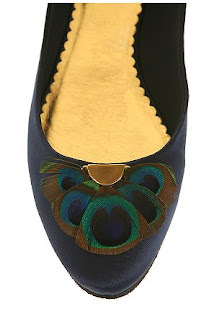 Fairy Tales Are True feather skimmer, $38. Jebus, these shoes make me want to say "boo urns"--in a good way. I love your list. Every time I see James Franco I just think "bedroom eyes." "Jebus" makes me so happy. And that sweater coat is amazing - you simply must buy it!! Those shoes are fantastic. If they weren't satin, I'd be all over them.